Let's talk about food. How do you feel about dairy? Meat? Cheese? Food is a very personal thing. And feeding your brand new perfect angel baby? The most personal. For many people, like me, food is not only personal, it's also a passion. So when Charlie was just a little thing in my belly, I was already thinking of how I wanted her to experience it. I had visions and aspirations of Charlie eating the same food we do. Healthy, organic whenever possible, plant-based, low in sugar. I also wanted her to enjoy eating and not feel pressured around food. I wasn't sure how this was going to play out but I knew it needed to be fun and light. Breastfeeding came with challenges, so when it was time to start Charlie on solids, I wasn't sure how it was going to go. Around 4 months, I gave her some avocado and she LOVED it, but then, as it goes... I got fearmongered into thinking that she shouldn't do solids until she was 6 months. But homegirl kept reaching for my food and watching us eat, so just before 5 months, we seriously started Charlie on solids. She was a champ since day one, and I am SO grateful for that. We have had lots of challenges on our journey with our little love, but food has not been one of them. Charlie basically skipped over the puree section of being a baby and jumped right into true solids. She devours most of what we put in front of her - she was chowing down on smoked fish at 5 months old, loving rotisserie chicken at 6 months, snacking on shrimp shumai at 7 months and everything in between. Now at almost 10 months, I swear she eats almost as much as I do... 3 meals a day plus snacks. Plus milk! This girl loves to eat - today after her sizable lunch, she grabbed a cookie from my hand and ate it! So how did we feed her? Our pediatrician is a fan of baby led weaning, which sounds like the opposite of what it actually is. In baby led weaning, your baby feeds themselves, without your intervention. You set up some finger foods and let them go to town. Warning, this gets really really messy. We started out with BLW and I quickly decided that cleaning oatmeal out of Charlie's ear wasn't something I wanted to do on the daily. People seem to feel like it's BLW or nothing, but for us, it made sense to do a mix of us feeding Charlie and her feeding herself. I try to make most of her food, we do lots of pancake and waffles, with hidden veggies, chia seeds, hemp, etc. She loves meatballs so I'll do ones with hidden veggies in a marinara sauce. She really likes the Mama Chia pouches, I've tried to make them myself but she doesn't like them as much as the brand name one. You win some, you lose some - right? What I have found helpful for feeding is a baby mat or plate that sticks to the counter or table, bowls that also stick to the table, baby spoons, maybe one of the fancy feeding utensils, your fingers and a bib (shop all my favorites here!) And lots of paper towels! To be honest, Charlie is just wearing her diaper most of the time when she's eating, and we just wash off at the sink after - or if it's really bad - we'll take a dunk in the tub. She also ends up dropping or throwing food on the ground, so her eating zone always requires some sweeping and mopping up afterwards. Also per our pediatrician, we exposed Charlie to all of the allergenic foods early, because the new science shows that reduces her risk of developing an allergy. Eggs, peanuts, milk, cheese, tree nuts... she sampled them all in her early months. We made sure that the nuts were in nut butter form to prevent choking. Thankfully, she did not have any reactions - and now she eats eggs with me almost every day. 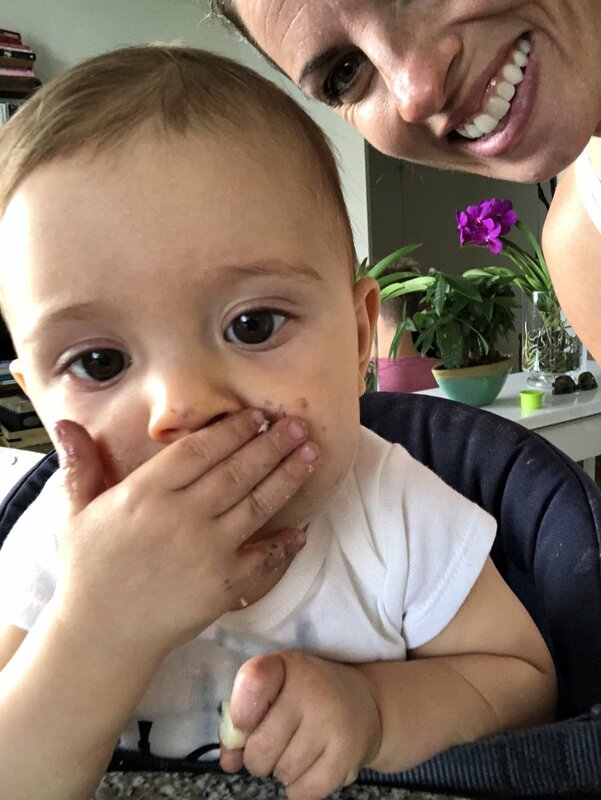 There are foods that Charlie didn't take to the bat, but I read to keep introducing foods to your baby, because it can take up to 10 times for them to start to like it. Like bananas, weirdly. She wasn't into them, then she loved them and now she's lukewarm on them. But I'll keep including them in the mix. I also include veggies in things whenever possible, like carrots and spinach in pancakes and spirulina in oatmeal. I also don't shy away from spices - my goal is to expose her to as many flavors as possible. I also add a little salt to her avocado and butter to her broccoli. My take is that I would rather her eat the veggies and enjoy them than have an early aversion to them because they don't taste good. Watching Charlie experience food has been a huge joy - our schedules don't align for dinner time (she eats at 6pm) but she and I eat breakfast and lunch together and we live out the vision of our little family breaking bread when she joins us for weekend brunch and we all eat together at home - it brings such a smile to my face. Mike and I also offer Charlie a taste of everything that we are eating and drinking, which is how she became a kombucha fan at 5 months old. It's still her favorite drink (besides milk, of course) - she even likes the intense flavors like ginger and cayenne. She's such a funny kid! The only hiccup in Charlie's feeding journey, if you can call it that, is that she really is not into her highchair. She lasts a few minutes but then cries to get out, so we purchased a learning tower that allows her to stand at counter height and it changed everything. She hates to be bucked in so this way, she can sit and stand as she pleases and now she will hang out at the counter watching me as a I prep and cook food - whereas before she would cry to be picked up so she could see everything. It's super easy to overthink how and when you are feeding your baby - god knows I've overthought pretty much everything with this Charlie - but with eating solids, it has been a really fun, messy and joyful experience that we have all shared together.